I have always loved history told through stories. I gravitate often towards historical fiction when reading because I throughly enjoy learning about people, places, and events that I didn't know of before. I sincerely believe that the more we know about other people, their challenges, and their resolve, the more empathetic we become ourselves. For me, historical fiction allows me to walk in the shoes of others in a very accessible way. This has certainly been the case with C. W. Gortner's new novel, Marlene. From cabarets in Germany to Academy Award nominations in Hollywood to actively serving during World War II, the life of Marlene Dietrich was nothing short of fascinating. A lush, dramatic biographical novel of one of the most glamorous and alluring legends of Hollywood’s golden age, Marlene Dietrich—from the gender-bending cabarets of Weimar Berlin to the lush film studios of Hollywood, a sweeping story of passion, glamour, ambition, art, and war from the author of Mademoiselle Chanel. Raised in genteel poverty after the First World War, Maria Magdalena Dietrich dreams of a life on the stage. When a budding career as a violinist is cut short, the willful teenager vows to become a singer, trading her family’s proper, middle-class society for the free-spirited, louche world of Weimar Berlin’s cabarets and drag balls. With her sultry beauty, smoky voice, seductive silk cocktail dresses, and androgynous tailored suits, Marlene performs to packed houses and becomes entangled in a series of stormy love affairs that push the boundaries of social convention. For the beautiful, desirous Marlene, neither fame nor marriage and motherhood can cure her wanderlust. As Hitler and the Nazis rise to power, she sets sail for America. Rivaling the success of another European import, Greta Garbo, Marlene quickly becomes one of Hollywood’s leading ladies, starring with legends such as Gary Cooper, John Wayne, and Cary Grant. Desperate for her return, Hitler tries to lure her with dazzling promises. Marlene instead chooses to become an American citizen, and after her new nation is forced into World War II, she tours with the USO, performing for thousands of Allied troops in Europe and Africa. But one day she returns to Germany. Escorted by General George Patton himself, Marlene is heartbroken by the war’s devastation and the evil legacy of the Third Reich that has transformed her homeland and the family she loved. An enthralling and insightful account of this extraordinary legend, Marlene reveals the inner life of a woman of grit, glamour, and ambition who defied convention, seduced the world, and forged her own path on her own terms. This book is told from Marlene's perspective, and I found it very easy to connect with her. I felt as though Marlene herself was telling me about her life, or that I was reading her personal journals where she had been documenting her extraordinary life's journey. I found the writing style very captivating, and Gortner authentically brought to life many people, each with their distinct traits and characteristics. This novel is incredibly well-researched and very enjoyable to read. In the notes at the end of the book, Gortner says that every single person in the novel was real, and I sincerely appreciate that attention to detail. 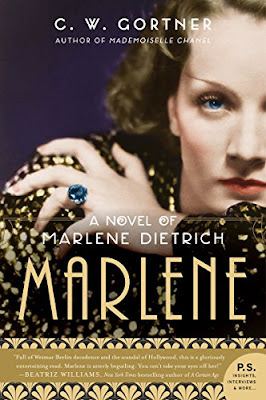 I haven't yet seen any of Marlene Dietrich's movies, and to be honest, I didn't have more than a vague idea of who she was before I read this book; however, with her independence and determination, Marlene is certainly a woman I will not soon forget. I'm so happy to have learned her story, and I look forward to seeing some of Marlene's movies that Gortner describes in the book. 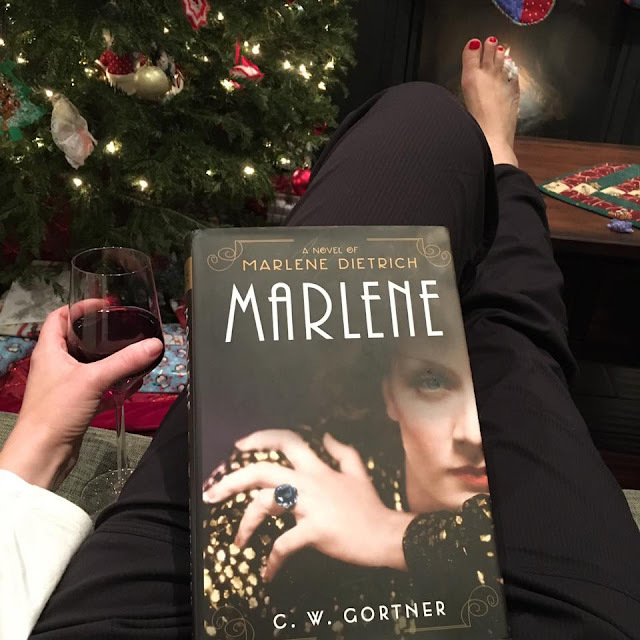 While Marlene is not technically a memoir, anyone who enjoys reading either historical fiction or memoirs will certainly enjoy reading Gortner's book. Among other novels, C. W. Gortner also wrote Mademoiselle Chanel, which I've added to my TBR list. You can connect with him on Facebook, Twitter, and his website. Marlene is available for purchase from HaperCollins or Amazon. Disclaimer - I was sent a copy of this book courtesy of HarperCollins and TLC Book Tours. All thoughts and opinions are entirely my own. To read what other bloggers had to say about Marlene, check out the full book tour.